Thanksgiving is a time to celebrate the people who bring meaning to our lives, the people who help us make a difference for busy families every day. 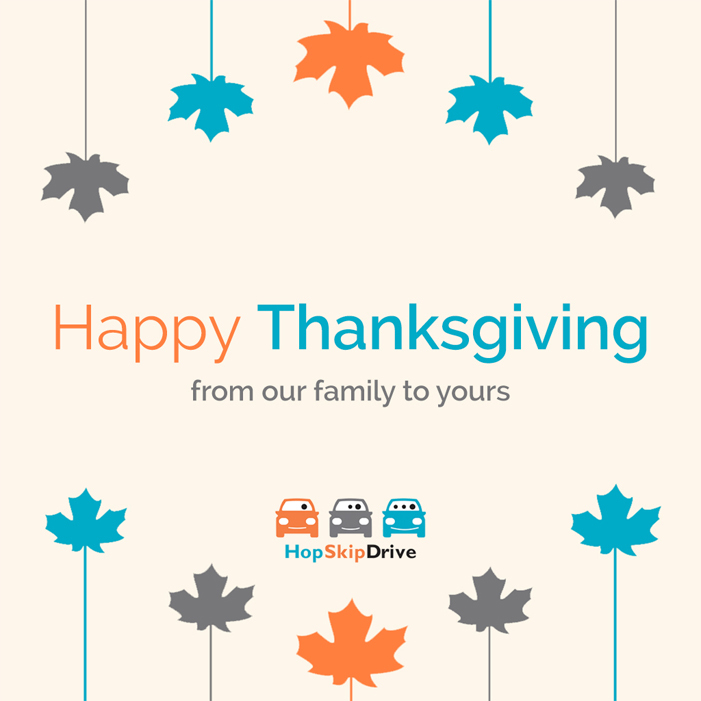 Here at HopSkipDrive, we want to thank our many families — the families who ride with us, our family of CareDrivers, the HopSkipDrive staff and our own personal families. Thank you to our customers for the opportunity to drive your most precious cargo. Hearing about how we’re changing your lives is what keeps us going every day. We’ve heard from parents who got the promotion they wanted because they no longer had to miss work to handle their child’s transportation. We’ve heard from kids who made their club sport’s traveling team because they were able to get to a distant practice. And we even got to hear about a sibling we took to the hospital to meet her new baby sister. Thank you to the HopSkipDrive CareDrivers for everything you do to make sure kids get where they need to go safely and reliably. We often hear from riders about how you arrive with a smile and make them feel comfortable and safe on their rides. Your enthusiasm for kids and commitment to safety is a big part of what makes parents love HopSkipDrive. And thank you to the passionate people at HopSkipDrive headquarters who every day show their deep understanding of the importance of delivering every single ride with the highest standards of safety and excellence. From the tech team to operations, marketplace and customer support — your commitment to our company values shines through in everything you do. As founders, we couldn’t have created any of this without the support of our personal families. Our eight kids are growing taller and more independent, continuing to use HopSkipDrive to get to even more activities. The support of our own families is what helps us make a difference for so many other busy families, and we’re grateful to all of you. From our families to all of yours, wishing you a very happy Thanksgiving.